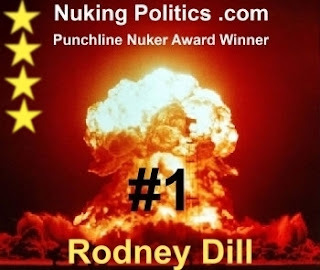 It is official: the contest for Punchline Nuker of the Year is between Rodney Dill and Bob in Feenicks, as nobody else was able to secure a spot as Punchline Nuker of the Week this week. Our winner for this week, by a commanding victory, was of course Rodney Dill, putting him a point ahead of Bob in the race for the funny guy of the year. The tally: 5 wins for Rodney to 4 wins for Bob. This race is still open, with just two more weeks to go. Bob has to win them both to gain the prize, so this is Rodney's contest to lose.